Using an SMTP server to send emails is faster and more reliable because the emails sent through the SMTP server have more chances to be delivered into the Inbox. If your ISP SMTP server is able to handle many messages at a time and does not impose strict email sending restrictions, you can use your ISP SMTP settings in EasyMail7. You can use G-Lock Apps delivery and spam testing tools to test your Inbox placement with major ISPs around the world including Yahoo, AOL, Hotmail and Gmail. You’ll also get your email spam scores, authentication issues, and daily blacklist monitoring to check if your server’s IP address is blacklisted or not. 1. Open EasyMail7 and login. 2. Go to Workplace -> Outgoing Mail Accounts. 4. Type the account name and enter the sender information. 5. Click on the Delivery Options tab. 6. Select “Send via SMTP server” delivery mode. 7. Enter the name of the SMTP server and the port number. 8. If the SMTP server requires authentication, check “My server requires authentication” option and enter your Login and Password. 9. If the SMTP server requires a secure connection, enable the SSL protocol (STARTTLS or SSL). These parameters are used in your email client software, therefore you can simply “copy” them from a working email account in your email client and enter them in the Account settings in EasyMail7. If you have an account with free email service providers, you can use their SMTP settings in EasyMail7 too. 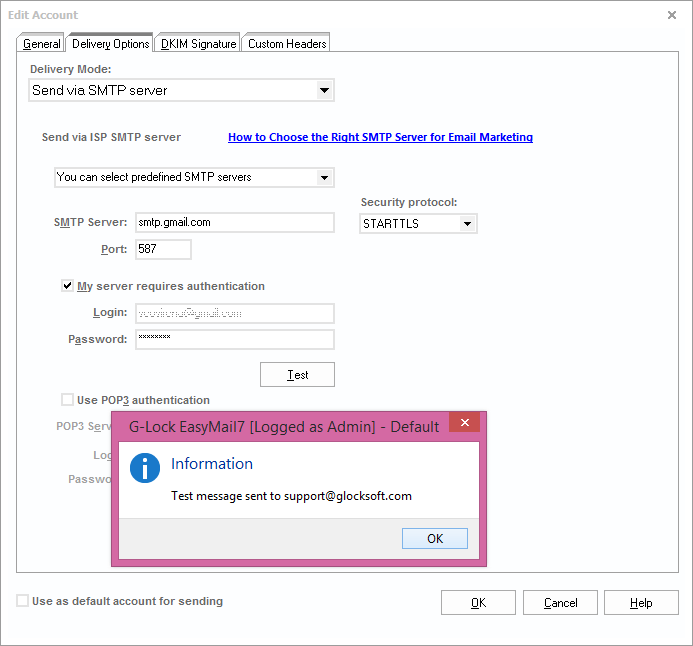 Below you’ll find how to use Gmail, Yahoo!Mail, MSN/Hotmail, AOL, Lycos and GoDaddy SMTP Settings in EasyMail7. Plus, they all have different sending policies and restrictions that you need to be aware of. To make sure the SMTP settings are correct, click on the Test button. If the test passes, your SMTP settings are correct. Click Close and then OK to save the account settings. Yahoo!Mail Restrictions: max 100 emails per hour. Read more about Yahoo Anti-Spam Policy. And here you can read how to comply with the ISP sending restriction using EasyMail7. MSN/Hotmail Restrictions: max 100 emails per day. Lycos Restrictions: max 25 recipients per message and max 250 emails per day. Due to sending restrictions free SMTP servers do not suit for sending marketing emails in high volumes. That’s why if you have an email list that is big and growing, you should think about getting a more powerful SMTP server that allows to send as many email messages as you need. Here you can read about all possible options to get a professional SMTP server for email marketing. Whatever SMTP server you choose, you can use it in EasyMail7 to send email newsletters to your subscribers.